Dr. Moats is an experienced and respected researcher in the field of reading. A thorough and systematic discussion of the connection between language structure and how individuals learn to read. This book provides valuable information for any teacher teaching reading or vocabulary in content area classes. 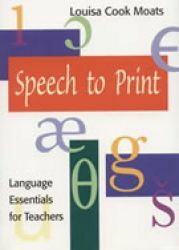 Speech to Print includes exercises, examples and analysis of students' reading and spelling errors, along with simple lesson plans. This provides a clear, easy-to-follow format that greatly helps the reader understand the organization of written and spoken language. The book provides specific strategies to recognize, understand, and solve the problems any student (with or without disabilities) may encounter when learning to read and write. Throughout the chapters and again at the end of each chapter, Dr. Moats provides quizzes and application exercises to help the reader use the information that was discussed. This books is also a valuable tool for parents also who want a resource regarding literacy skills.